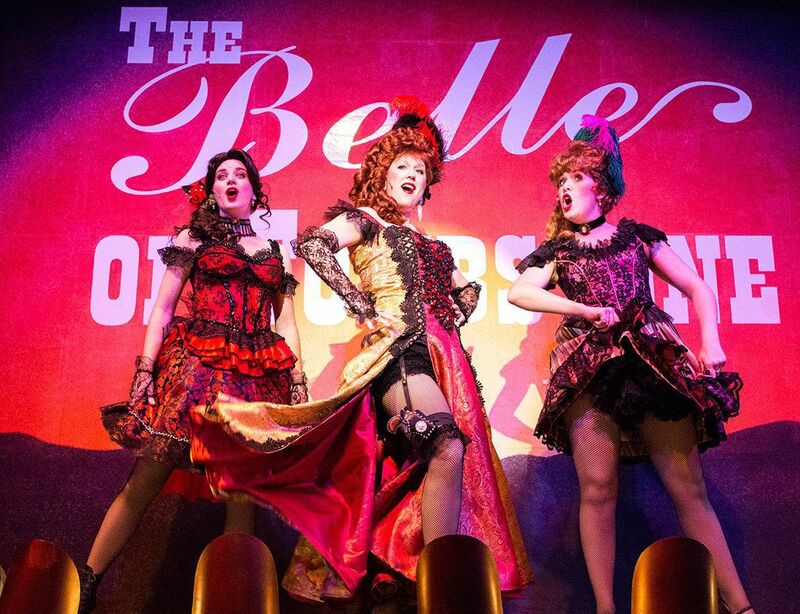 “The Belle of Tombstone” at Tucson’s Gaslight Theatre, 7010 E. Broadway, goes back to the days of bar room brawls, stage coach robberies and high-stepping saloon girls. Family Friendly Improv Comedy — Unscrewed Theater, 4500 E. Speedway. Taking suggestions from the audience, performers create games and scenes right off the top of their heads. Nonprofit 501c3, tax deductible donations appreciated. 7:30-8:30 p.m. Friday and Saturdays. $8. 289-8076. unscrewedtheater.org. House Team Double Feature — Unscrewed Theater. “Leaky Faucets” and “Comic Chaos” perform long form Improv Comedy based on audience suggestions. Ages 17 and up. 9-10:15 p.m. Jan. 19. $8. 289-8076. unscrewedtheater.org. Free Form Fight Night — Unscrewed Theater. Improv team battle. Four teams enter, only one will remain. Every show is different. Ages 17 and up. 501c3. 9-10 p.m. Jan. 25. Free. 289-8076. unscrewedtheater.org. Carnival of Illusion: An Evening of Old-World Magic — Scottish Rite Grand Parlour, 160 S. Scott Ave. Vaudeville-inspired illusion show. Ages 8 and up. 4:30 and 7:30 p.m. Saturdays. $35. 615-5299. carnivalofillusion.com. The Dinner Detective Interactive Murder Mystery Show — Doubletree by Hilton Hotel Tucson - Reid Park, 445 S. Alvernon Way. Ages 15 and up. 6-9 p.m. Saturdays. $49.95. 1-866-496-0535. thedinnerdetective.com. Till Death Do Us Part - A Big Fat Murder Mystery — The Gaslight Music Hall, 13005 N. Oracle Road, Oro Valley. Join the Romano Family and the Manchego Family as they celebrate the bride and groom in a night full of singing, dancing, and murder. 6-8 p.m. Jan. 21 and 28. Through June 10. $38.95 includes a three-course meal and a show. 529-1000. gaslightmusichall.com. Poetry Circle — Oro Valley Public Library, 1305 W. Naranja Drive. This month's topic: Shakespeare Sonnets: Exploring this essential poetic form. This event is for adults and teens. Docents will provide reading material sourced from the Poetry Center. 2-3:30 p.m. Jan. 24. Free. 594-5580. UA Prose Series: Nicole Walker — University of Arizona: Poetry Center, 1508 E. Helen St. Walker's upcoming works include: "Sustainability: A Love Story" (2018) and "A Survival Guide for Life in the Ruins" (2019). 7-8:30 p.m. Jan. 24. Free. 626-3765. poetry.arizona.edu. Guys and Dolls by Frank Loesser The Santa Cruz Shoestring Players — CPAC Community Performance and Art Center, 1250 W. Continental Road, Green Valley. A con-man Nathan Detroit’s efforts to set up a floating crap game while avoiding the wrath of his fiancé, the delightful Miss Adelaide (who is desperate to marry Nathan after a 14 -year engagement). 7-9 p.m. Jan. 17-19 and 24-26; 3-5 p.m. Jan. 20 and 27. $20. 399-1750. CPAC Community Performance and Art Center. The Belle of Tombstone — The Gaslight Theatre, 7010 E. Broadway. Go back to the days of bar room brawls, stage coach robberies and high-stepping saloon girls. Call for show dates and times. $22.95. 886-9428. thegaslighttheatre.com. My Life in Sports — The Scoundrel & Scamp Theatre, 738 N. Fifth Ave. A journey into the life of a boy growing up in post-war America. Written and performed by Tucsonan Bill Epstein. Ages 14 and up. 7:30-9:30 p.m. Jan. 17-19, 24-26; 2-4 p.m. Jan. 20 and 27. $28. 448-3300. scoundrelandscamp.org. Stage Kiss — Live Theatre Workshop, 5317 E. Speedway. When two actors with an amorous history are thrown together as romantic leads in a forgotten 1930s melodrama, they quickly lose touch with reality as the story onstage follows them offstage. 7:30-9:30 p.m. Jan. 17-19, 24-25; 3-5 p.m. Jan. 20. Through Feb. 16. $20. 327-4242. livetheatreworkshop.org. Cat on a Hot Tin Roof — Roadrunner Theatre Company, 8892 E. Tanque Verde. Saga of death, deceit and desire. Starring Sara Jackson, Robert Anthony Peters, Roger Owen and Cynthia Jeffery. 2-4:30 p.m. Jan. 20; 7-9:30 p.m. Jan. 18 and 19. Through Feb. 3. $20. 207-2491. roadrunnertheatrecompany.org. Roadrunner Theatre Company. Dear Liar by Jerome Kilty — The Community Players Theatre, 1881 N. Oracle Road. Love letters between George Barnard Shaw and Mrs Patrick Campbell. 7:30-9:30 p.m. Jan. 18 and 19; 2-4 p.m. Jan. 20. $18. 887-6239. communityplayerstucson.org. Two Trains Running — Temple of Music and Art, 330 S. Scott Ave. There's a new president in the White House. Racial tensions are on the rise. But no, it's not 2018. It's 1969 - and the civil rights movement is sending tremors through Pittsburgh's Hill District. 7:30-10 p.m. Jan. 19, 22-25; 7-9 p.m. Jan. 20. Through Feb. 9. $25. 622-2823. arizonatheatre.org. The Brave Knight, Sir Lancelot — Live Theatre Workshop, 5317 E. Speedway. Join Lancelot on his quest to find action, adventure, dragons, and damsels in distress, all in the hopes of becoming a brave knight. 12:30-1:30 p.m. Jan. 20. Through March 24. $10. 327-4242. livetheatreworkshop.org. Cat on a Hot Tin Roof — Temple of Music and Art Cabaret Theater, 330 S. Scott. Starring Sara Jackson, Robert Anthony Peters, Roger Owen and Cynthia Jeffery. 7:30-10 p.m. Jan. 24 and 25. Through Jan. 27. $20. 207-2491. roadrunnertheatrecompany.org. Roadrunner Theatre Company.